I highly recommend anyone with a history of prolonged and agonizing pain at the very least investigate NUCCA! After years of excruciating pain, I literally stumbled in to the Precision Wellness Centre with tears streaming down my face. “Fix me now!” I cried. Thank you Dr. Chris and Jill for straightening me out! Your patience and dedication to the least invasive and most proactive approach to health and wellness I believe has led me to the best quality of life I have ever enjoyed! After at least 16 years of some level of pain, I have been pain free for 6 months (and counting!). It is without hesitation that I frequently recommend others to visit you for a health assessment. Thank you for making a difference in my life! In my twenties I started to suffer from a sore neck, sore back, cramping in my calves and just put it down to my body getting older. A few more years passed and steadily the pain got worse until I decided to deal with it once and for all. 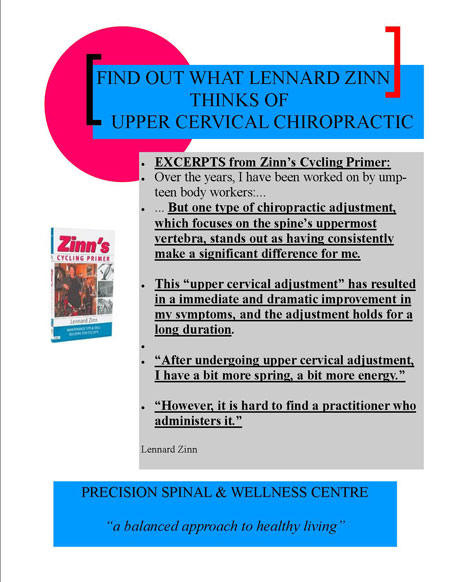 An advert in the local paper regarding NUCCA chiropractic caught my attention, it was comprised of questions and answers and testimonials which I read with interest. I came to see Chris Long with a list of questions which he patiently answered and from there decided to go ahead with treatment. I have to admit I was a little cynical due to having been treated by other chiropractors and was expecting (dreading) bone cracking manipulation. On the contrary, the first session was very interesting, pain free and so unobtrusive that I thought it couldn’t possibly work!! But within a month or so I noticed my hips were balanced again, I was walking straighter and the best news of all … no pain anywhere. The other positive aspect of Precision Spinal Care is that Chris teaches you how to recognize when you are balanced and “in” so you can take charge of your spinal health. I still don’t understand how NUCCA works but I don’t really care anymore. I am an advocate of NUCCA and thoroughly recommend talking to Chris Long if you have recurring pain or some other health issue. The benefits I experienced from NUCCA chiropractic were definitely more than I expected. Small body aches and pains and any back discomfort I experienced before are now gone and I can honestly say that I truly feel like I entered into a new body. I feel more fluid in my movements and much more balanced in my stance. I love it. I just want to say how much I appreciate your treatments. After seeing countless doctors and chiropractors over the past fifteen years, Dr. Long is the first one that has been able to help me. My back pain was getting worse every year but now I am pain free the majority of the time! All this, and without the sometimes violent treatment methods of some chiropractors. I don't understand how it works but, who cares, it works! Thank you so much! He taught me that the tightness was merely a symptom of a much more important physiological concern: the condition of my spine, and it’s affect on my overall health. He gave me realistic hop that I can avoid, or quickly overcome, any ailments like the one that originally motivated me to seek this help. He made me wish I had met him long ago, because it’s now obvious that various discomforts I’d experienced were all symptomatic of spinal misalignment. He would have spared me a lot of discomfort, and many futile visits to other kinds of therapeutic practitioners. He helped me see that continued spinal care is essential to prevent further symptomatic problems, such as the bone spur that was developing in my neck. He opened my mind to the absurdity of thinking that regular dental care is essential while regular spinal care is not. Given a choice, I’ll take a healthy spine over healthy teeth any day. He earned my absolute faith and loyalty. I trust him. I value his care every bit as much I do that of my allopathic physician. He showed me that even if I’d experienced no symptoms of spinal misalignment, the preventive benefits if his care would be invaluable to my future overall health. If I’ve left any doubt that you should at least visit Dr. Long for an assessment, then you’re welcome to call me at 678-3544. Because the only pain I now suffer with regard to my spine is the awareness that many people need the care of a NUCCA chiropractor but don’t know they need it. Up until 8 weeks ago when Dr. Chris Long started treating me, I vowed I would never be treated by a chiropractor again due to a very bad experience years ago. My husband was first treated by Dr. Long and when I saw what he did for him it regained my confidence. I have suffered for about 25 years with a very sore neck and shoulders due to a whiplash injury I sustained at that time. There were times when I didn’t think I could hold my own head up – it felt like it weighed a ton!! I could only work on my computer for a minimal time before the pain started. I am so amazed what Dr. Long has done for me in those 8 weeks. He advised me at the beginning of the treatment that it may take longer for relief due to the length of time since the accident. In the eight weeks I only required two adjustments which were very gentle with minimal pressure used on my neck area. Today I have no heavy feeling or no pain and I can not explain in words how grateful I am for the NUCCA procedure and Dr. Long. I would highly recommend Dr. Long and the Precision Spinal & Wellness Centre to anyone who is suffering. Dr. Long and Jill are very caring people and care about your well-being. Thank you from the bottom of my heart to Dr. Long for the relief he has given me and restoring my faith in chiropractors. Being under NUCCA care has changed my life drastically. I am no longer fatigued and my arm pain has improved 80% I know that it will only continue to progress. Spinal Care with Dr. Long has had marked improvements on both my cycling power and efficiency. A year and a half ago, I had a mountain bike accident causing temporary full body paralysis. I had continual neck and mid back pains thereafter which would not subside with exercise. After my first NUCCA adjustment I felt great immediately and maintained my spinal alignment with continued exercise. After being involved in a motor vehicle accident 8 years ago, I was left with several different problems. I have suffered with migraine headaches, numbness and tingling down my left shoulder, the skin on my shoulder was numb to all feeling. I functioned with several nights of sleeplessness due to chronic pain. Since seeing Dr. Long I have no longer suffered any migraine headaches, the numbness and tingling has subsided and after several years of no feeling on my skin I can now feel a touch and sleep throughout the night without waking. Amazing what a few weeks of treatment has done for me. I have had less back pain in the last 4 weeks, from being noticeable to going days without any pain at all! I have less digestive problems and my sleeping is much better. 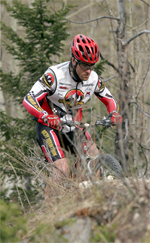 As cycling is a major passion, I spend a great deal of time riding both road and mountain bikes. Through previous injuries I had come to a point where riding, and in fact walking had become painful. Dr. Long provided me with information that explained both the root cause of my ailment and his methodology to getting me back on track. The diagnosis, treatment plan and process he has implement has alleviated my leg pain and enabled me to get back to a normal pain free existence and improved my pedalling strength on the bike. I had some heavy pains in my hip, lasting for several months. After my first session and the amazing gentle adjustment, the pains were significantly reduced, and now a couple of months later, instead of hardly being able to stand I can walk and work again! It works!